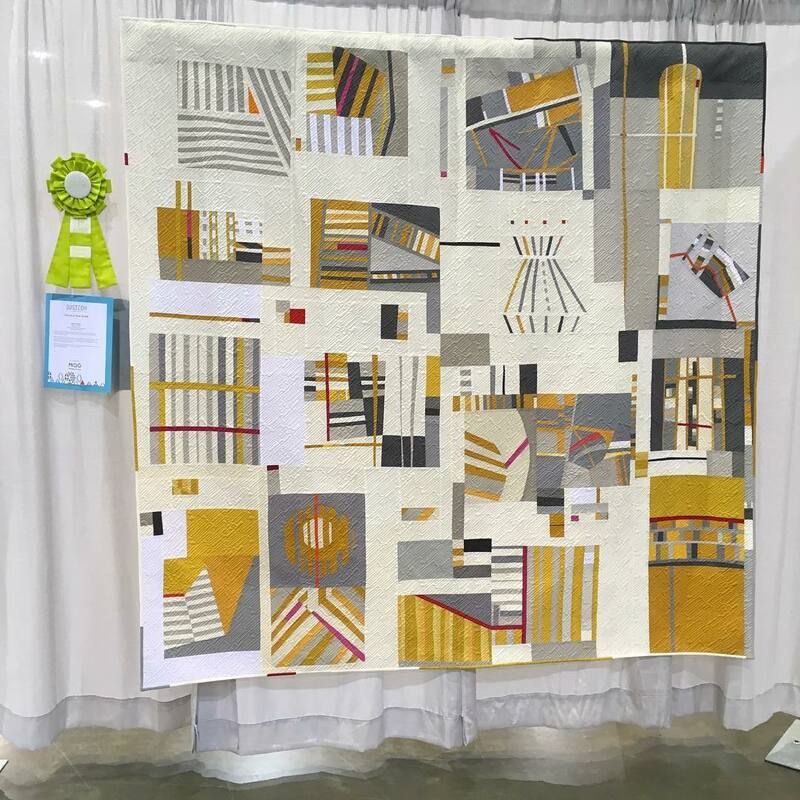 Here’s the really big news this month: we have QuiltCon Winners and Finalists in our midst. Congratulations to all! The March 8th meeting took place at Fancy Tiger Crafts, with 21 members attending and three first-time visitors. Thanks for coming, everyone! Be sure to check out our Facebook page for more photos from the meeting. Julie E. has volunteered to serve as secretary for the remainder of the year. Other nominations were encouraged. The guild will vote, via email, next week. One of our charity quilts will be donated to the Boulder County Equine Therapy Treatment Center for use during its upcoming fund-raising campaign. April is the last month for the current roaming bee. Blocks will be due at the April meeting, the guild top will be completed in May and quilted in June. There are two months left in the second bee. Bees will be suspended over the summer months and will restart in the fall. The March sew day has been scheduled for Sunday, March 26, at the Jefferson County buildings in Golden. Details will be posted on the website. All finished quilts are due at the April business meeting. Julie Elliott will lead the show promotion committee. Please contact Julie if you’re willing to help. Just a reminder: All of the quilts must be submitted with a 4″ wide hanging sleeve stitched to the back. All quilts must have a label with the maker’s name, title of the piece and phone number attached to the back lower right hand corner. All quilts must be finished (quilted and bound); no tops or partially finished quilts will be allowed to hang. Please see the Show Guidelines for more information. Deadline is May 1st, more info on website. A special exhibit of original student and faculty designed and crafted quilts. Saturday, March 18, 2017 from 4-6pm. Makers’ Space Idea Forge at CU Boulder. Stephanie is asking for DMMQG members for quilts to hang along side of the students work. Contact her if you are interested. 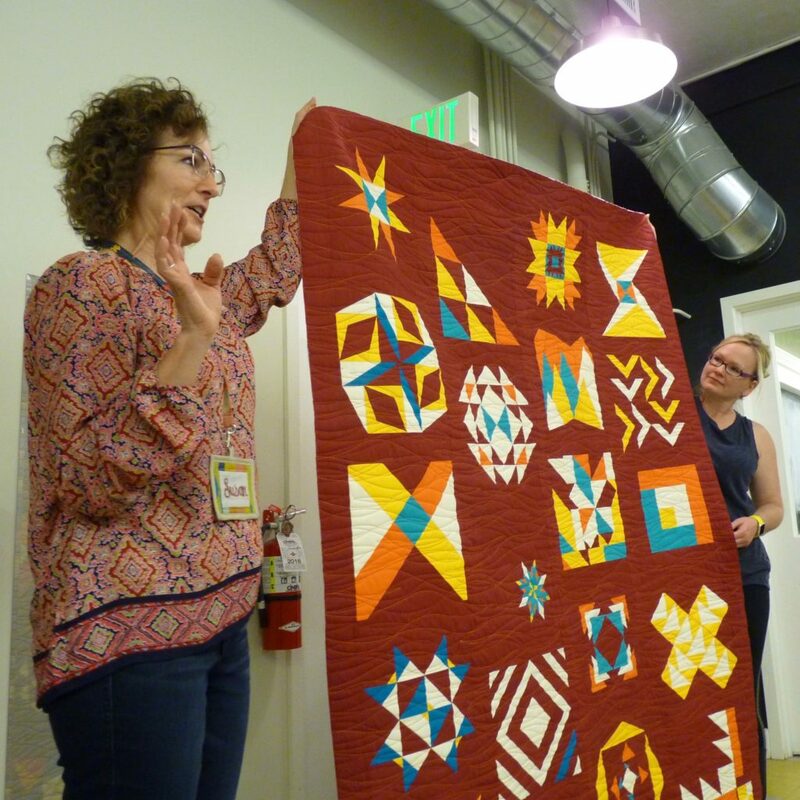 Shelby, Christine and Judy gave brief overviews of how to block a quilt, make a hanging sleeve, and how to finish your quilt using a facing rather than traditional binding. Thank you, Shelby, Christine, and Judy!